Wed., Feb. 1, 2017, 12:59 p.m.
NEW YORK – Hillary Clinton has a lot of plans for 2017, including some reflections on her stunning loss last fall to Donald Trump. The former secretary of state, senator and first lady is working on a book of personal essays expected to come out Sept. 26, Simon & Schuster told the Associated Press on Wednesday. The book, still untitled, is structured around hundreds of favorite quotations that have inspired her. The publisher said Clinton will use the quotes to “tell stories from her life, up to and including her experiences in the 2016 presidential campaign” and into her thoughts on the future. “I hope by sharing these words and my thoughts about them, the essays will be meaningful for readers,” Clinton added. Clinton will also resume her relationship with the Harry Walker Agency, the speakers bureau she worked with after she stepped down in 2013 as secretary of state. Clinton’s lucrative career as a speaker, notably her talks sponsored by Goldman Sachs, were criticized by primary opponent Sen. Bernie Sanders of Vermont and others as a sign that she was too close to the financial industry. Clinton does have some speeches arranged, but not through the Walker agency, Clinton spokesman Nick Merrill told the AP. On March 8, she will address an International Women’s Day event organized by Vital Voices, the initiative Clinton and then-Secretary of State Madeleine Albright founded in 1997. 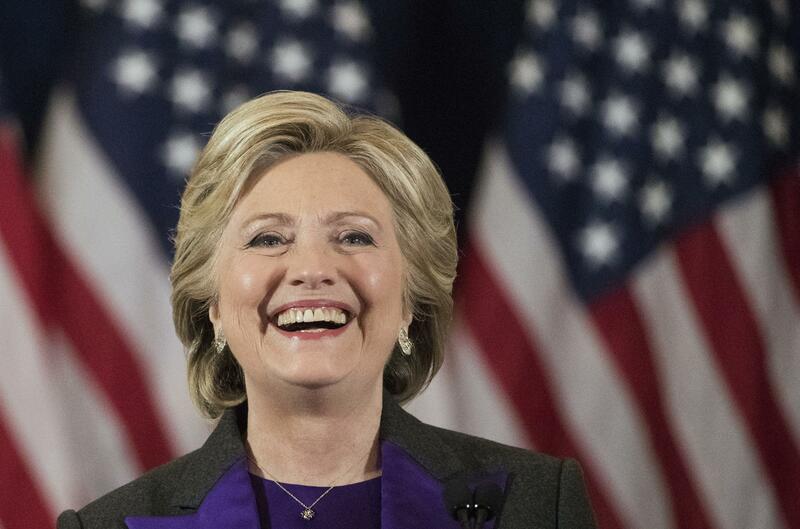 Clinton will speak at a gala for the LGBT Community Center in New York on April 20, and, on May 26, she will give the commencement address at her alma mater, Wellesley College. Her student address at the 1969 graduation ceremonies helped make her a national figure. Wednesday’s announcements mark a growing re-emergence for Clinton, who ran twice for the White House, hoping to become the country’s first woman president. She lost to Barack Obama in the 2008 Democratic primaries and, despite winning the popular vote, to Trump in 2016. Clinton, 69, was defeated in one of the harshest presidential elections in modern times, with Trump threatening to jail his opponent because of her use of a private email server while secretary of state. News reports have speculated that Clinton may run for mayor of New York City this year, although her book plans and return to the Walker agency make that unlikely. Merrill declined comment. Clinton has another project in the works: She will reissue her best-selling “It Takes a Village” in an illustrated edition for young people, Simon & Schuster told the AP. Clinton will collaborate with Marla Frazee, a two-time Caldecott finalist for the year’s outstanding picture book. The original “It Takes a Village” was Clinton’s first book and came out in 1995, when she was first lady. Clinton has since published “Dear Socks, Dear Buddy” and the best-selling memoirs “Living History,” which covered her life through her years as first lady and her successful Senate run in New York in 2000, and “Hard Choices,” about her years as secretary of state during Obama’s first term. If the 2016 campaign was her last, her book of essays would be her first written while she was neither in public office nor anticipating a future run. A Simon & Schuster spokesman said the book’s expected length was 384 pages, but declined to say how far along Clinton was with the manuscript. Simon & Schuster Carolyn Reidy said in a statement that she had been discussing such a book with Clinton since 1994. “We are delighted that Secretary Clinton finally thinks the time is right to share the words and thoughts that nourished and enriched her, and defined the experiences of her extraordinary life,” Reidy said. Financial terms were not disclosed for her essay collection. Clinton was represented by Washington attorney Robert Barnett, whose other clients include Obama and Clinton’s husband, former President Bill Clinton. Net author proceeds from “It Takes a Village” will be donated to charity. Published: Feb. 1, 2017, 12:59 p.m.